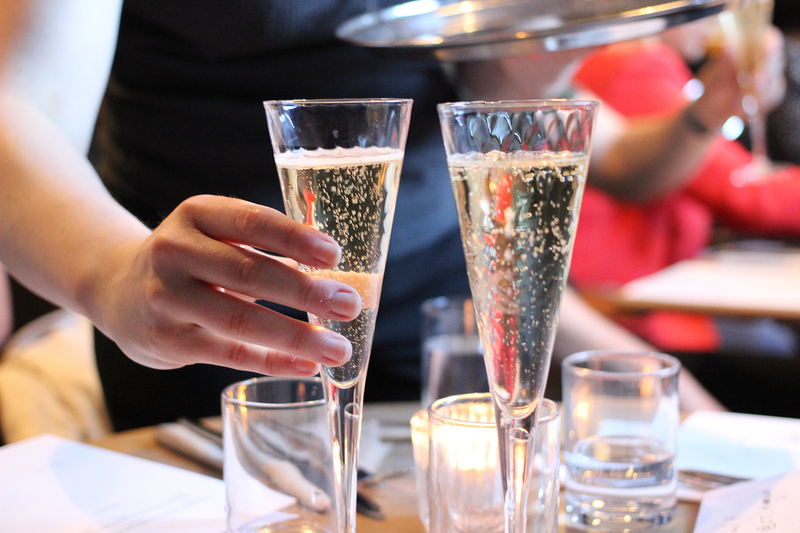 Little more than a whispered sponsored post on Facebook, a couple of tweets & a guest list only accessible by Gmail, A Lost Society’s pop-up evening last Wednesday 20th April screamed of London supper-club exclusivity and I wanted in. I’m that diner memes are made of, who methodologically dissects a menu before deciding to eat anywhere, and knowing exactly what I, and my unfortunate dinner date, will be ordering even before you can say the word “reservations” – this was not only a journey through history but into unknown, slightly terrifying eating waters; especially as I haven’t eaten beef since the horse meat scandal. So armed with a screenshot and my dinner date – documentary photographer Inès – we set off without even a sample menu for a guide. 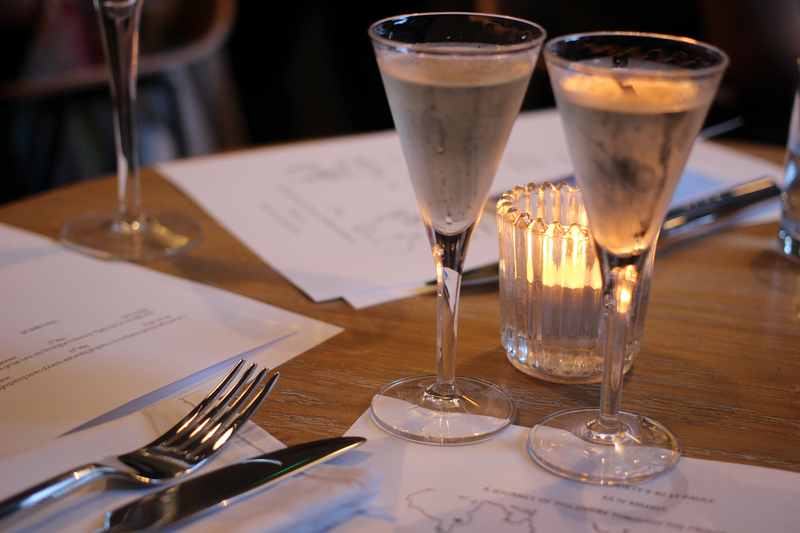 At six-courses & five paired drinks for £35pp – not including the sixth drink surcharge of £5 – this was still guaranteed value for money, especially with barman Robert Wood’s four-course Nomad gin-pairing dinner setting guests back £50+ just a few weeks back. 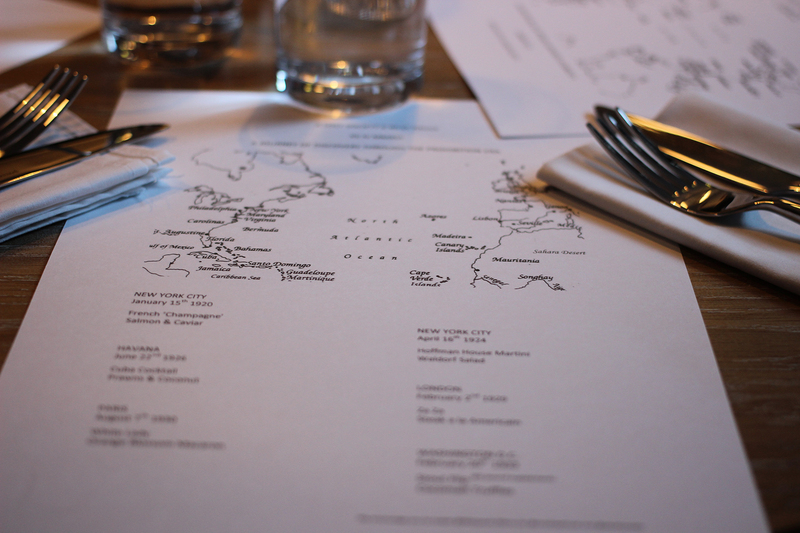 And when presented with a menu looking more akin to a treasure map than a simple list of food, you know a lot of effort has gone into prep & a project to make Arts Council proud. 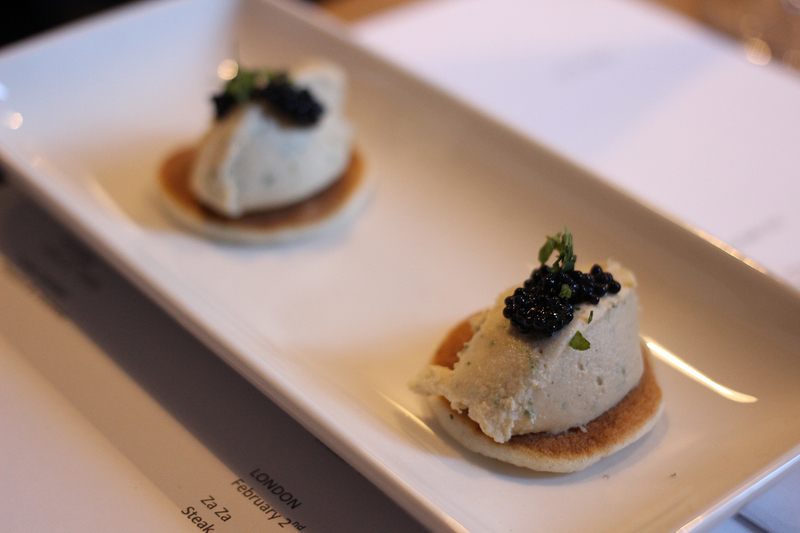 An odd approach – the opening amuse bouche is ‘set’ the day before prohibition. It’s party night, but funds are tight so our smoked salmon is actually salmon mousse, our caviar; herring roe and our champagne, sparkling wine with added ‘cordial’ to bring the depth & age reminiscient of your Bollingers, your Krugs & other champagnes we can’t afford to have tried. We’re assured the ‘truffle’ flavour is satisfied by their tonic though (oak moss), and indeed drink one goes down a treat. The mousse is maybe a bit powdery for me, the herring roe palatable but too much so, lacking the bitterness of true caviar & the blini so tender and soft it perhaps lacks the structural integrity of finger food and I nearly lose herring roe to the floor. Well, at least it’s not Beluga. If you know, you know. 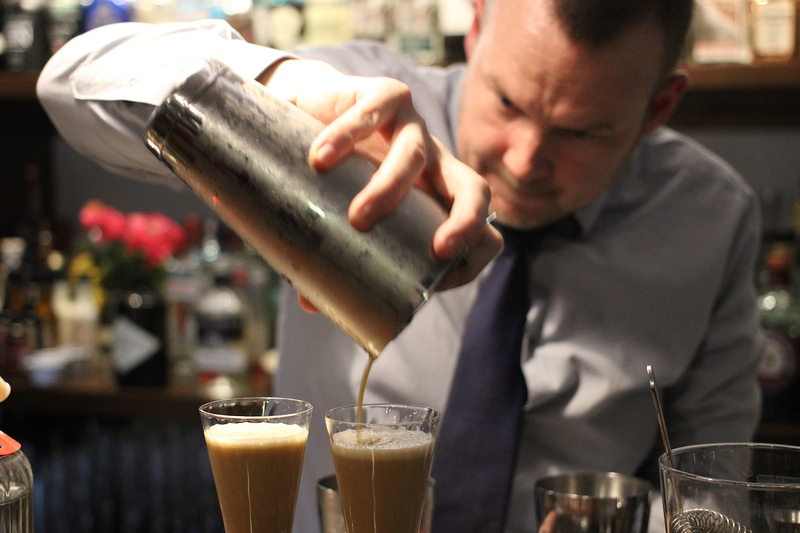 I like mine dirty, wet & skewered… martini style that is, and the Hoffman House take is a new one. Wet? There’s that vermouth, tick (because who throws away good booze anyway?!). Dirty? Rather than brine we have an herbaceous infusion that adds that saline kick, so tick. Skewered? No olive, so unfortunately no James Bond cigar (though it was shaken, not stirred). 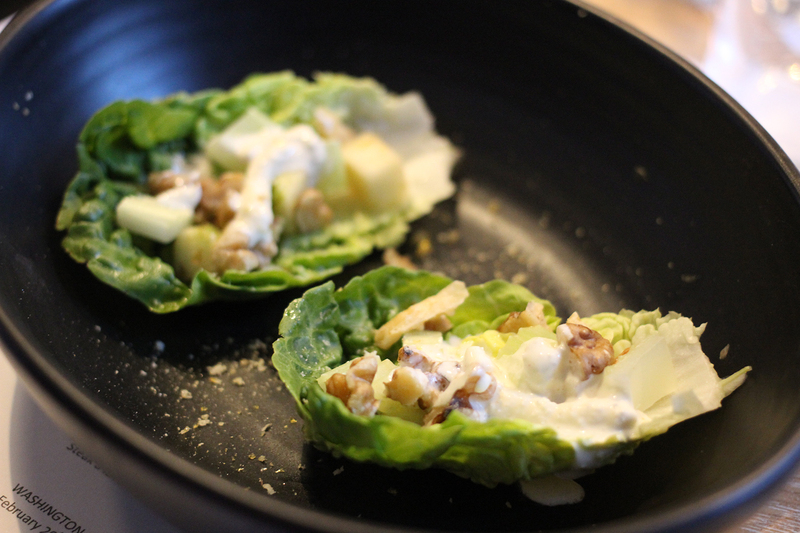 Though we learned that from a momentous hotel collaboration between the Waldorf and the Astoria, here the walnut made it’s debut in the Waldorf salad, the little gem housing cubed pear, celery & walnuts topped with melting blue cheese ice cream was underwhelming and too ‘safe’ for my stilton-loving tongue. 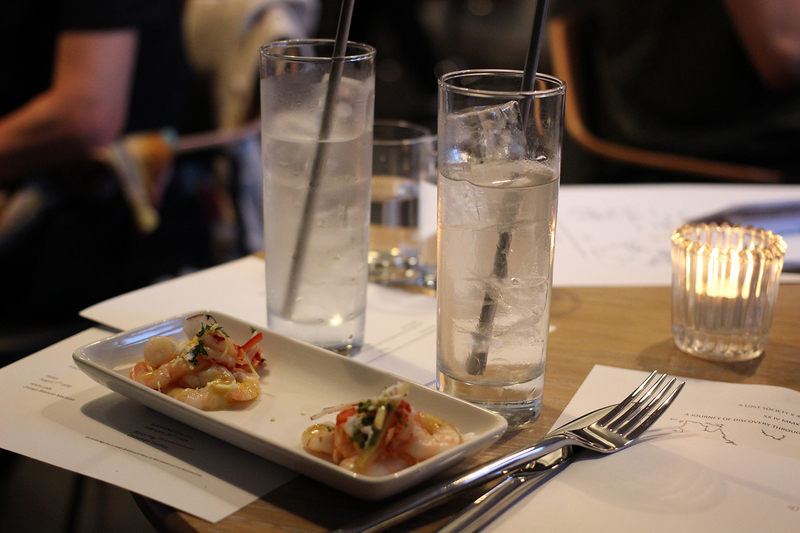 This course called to my Singaporean blood with a Cuban cocktail consisting of coconut water & gin with sesame undertones. An unusual mixture perhaps but as an oriental, sesame has always been a friend and this flavour carried through to the buttery dressing drizzled on top of prawns and crayfish. The seafood, garnished with thin strips of ginger, chili and coriander could have handled more kick, but it’s Cuba we’re in, not Singapore and as I’m not usually a fan of unshelled, cold prawns it did well. Though, with two prawns and two crayfish, portions could have been bigger. If the last course was a tropical dream, this one was a total nightmare. 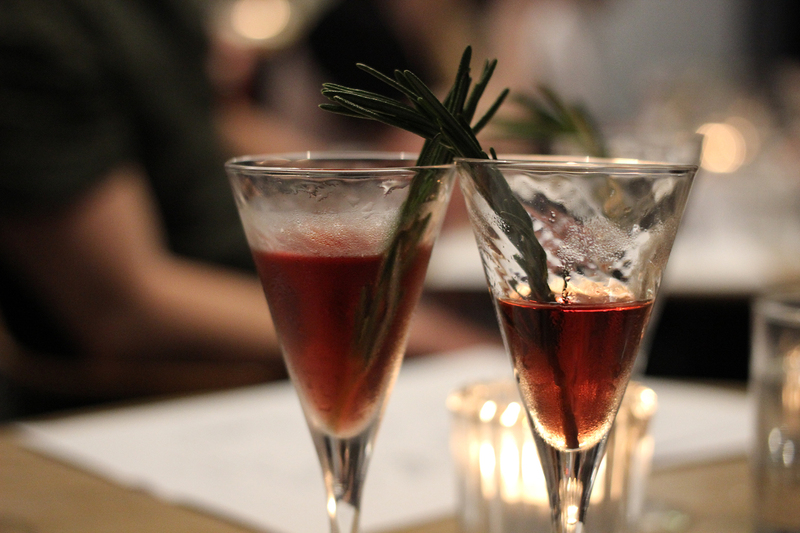 Though I was impressed with the gin, the pomegranate, rosemary and acid phosphate medley that turned the typically crisp and fresh g&t into a spicy, warm and merlot-esque drink that looked like something straight out of Transylvania… I did not like how this theme carried through to the meat course. Like steak tartare but actually served with tartare sauce?! Having all but not eaten beef for over 2 years since the Findus scandal and a bad experience with a pukka pie, too much to drink and a radiator, the idea of raw mince beef & raw egg and a sauce typically paired with seafood was everything I look to avoid by pre-reading menus. And, quite frankly, the presentation of the dish did nothing to quell those fears – small, burgery-patties mottled pink & brown aside a splodge of sun-tinged yellow sauce. But in the pursuit of a fair review I tucked in, and was strangely surprised. 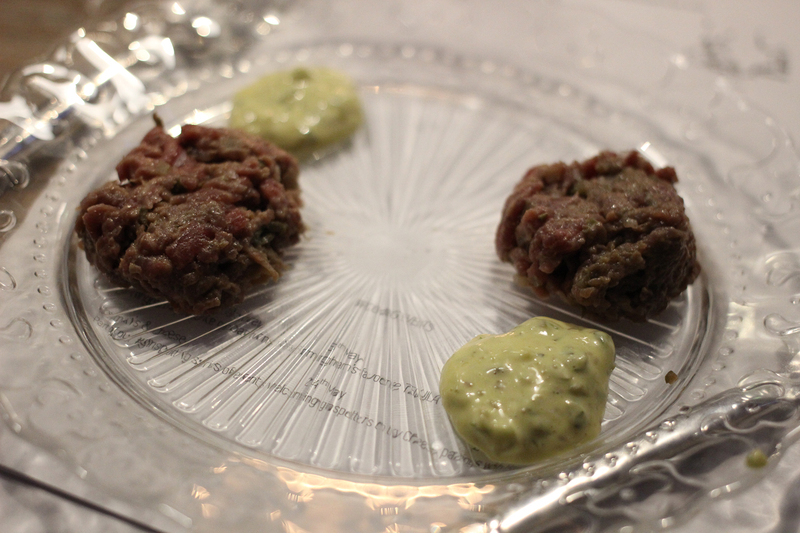 Garlicky & flavoursome meat alongside the rich, yolky smoothness of the tartare was an oddly satisfying combination. But presentation fought taste too well, and half of my portion went to a certain grinning photographer. Dessert couldn’t have come at a better time. 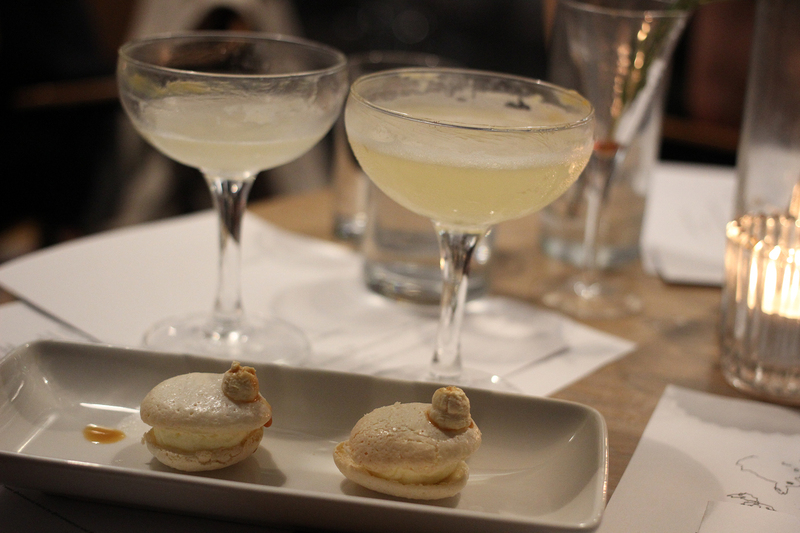 Not sure if it was the four previous cocktails or SALTED CARAMEL PAINT ON THE RIM OF MY GLASS but the sins of the raw beef were soon forgotten beneath the featherlight shells of my macaron and the smooth floral buttercream. I appreciated the bonus cream atop the macarons as a sort of garnish and the light drizzle of caramel sauce. The orange flavour was a hint, rather than a dominant flavour, and the citrus in the white lady cut through the sweetness of the dessert in a true hark to michelin pairing. They could’ve happily ended the meal here, and I’m almost sorry they didn’t. 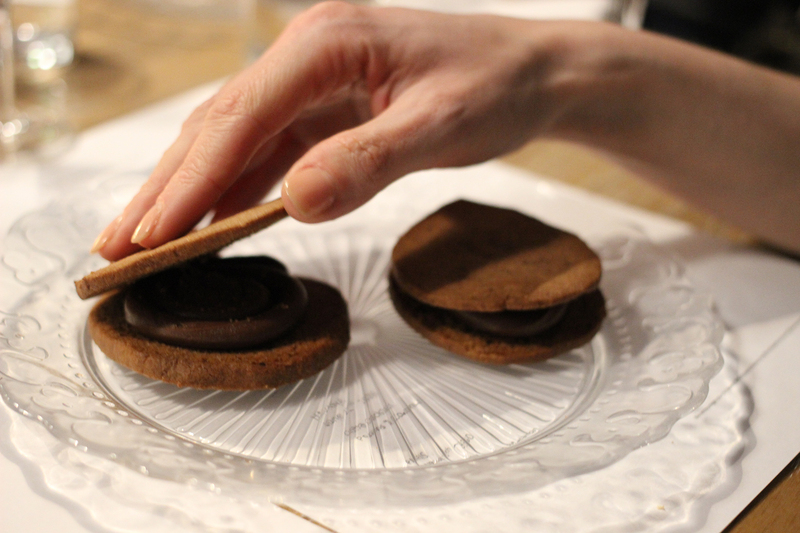 Despite being the U.S. version of ovaltine, the ‘malt’ used to create a chocolate-flavour did little to prevent this dessert from resembling a giant – albeit fancy – bourbon biscuit. Perhaps the humble boubon was significant to the times. But if it was, I didn’t catch why, and I definitely felt the transition – flight, turbulent landing & all from ‘Paris’ to ‘Washington’ as the complicated, texture-teasing course from before was replaced with this cookie sandwich. The dinner seemed to end as it started – overselling itself to a fault. If rather than a truffle, it had been described as a after dinner biscuit I may have been pleasantly surprised. But like someone presented with prosecco rather than champagne, roe rather than caviar, high hopes were dashed, rather than exceeded, and I think A Lost Society suffered most from odd marketing tactics, rather than faulty culinary skills. Overall, the experience was still fantastic value for money – suiting couples dinner dates, or groups of friends best, but would benefit from more careful menu curation, crafting and presentation. The hangry side of me appreciated the bonus courses but against my better judgement I would recommend A Lost Society stuck to focusing on their strengths, rather than challenging themselves to produce so many courses that were so often hit and miss. A classic case of quality over quantity. 40 St Paul’s excelled as ever though, and the drinks stole the show, especially considering most would spend the ticket price of £35 on cocktails alone on a standard Friday night. For their first foray into pop-up dining, A Lost Society hit the mark, but their branding still has a way to go.